I’ve been interested in photographing graveyards, graves and memorials for some time now. So, inspired by a question in this blog, this post is about a local grave – at the bottom of my street – and not about cycling at all. In 1926, Violet Gibson – from a well-to-do Anglo-Irish family – travelled to Italy, stayed in a convent in Rome, and one morning packed a small revolver into her handbag. She went to a public appearance of Benito Mussolini, drew her revolver and shot at Il Duce at point-blank range. She missed! The bullet grazed the bridge of his nose. Mussolini kept his nose bandaged for months and fascist propaganda photographs hailed him as a superman. How did she end up being buried in a Northampton cemetery thirty years later? Well, after the media fuss in Italy died down, she was returned to Britain under the pretext that she was mentally ill and she spent the rest of her life, pretty much alone, in St Andrew’s Hospital here in this town. (St Andrew’s had other interesting patients such as John Clare, the nineteenth-century poet, and Lucia Joyce, the daughter of James Joyce.) Hence, on her death, she received a simple burial in Kingsthorpe Cemetery. I’ve often wondered about the comma and the full-stop in her inscription. I’m very grateful to Peter Mulligan, a local historian of all things Irish in Northampton (and much else besides) for pointing out her grave to me in 2009. 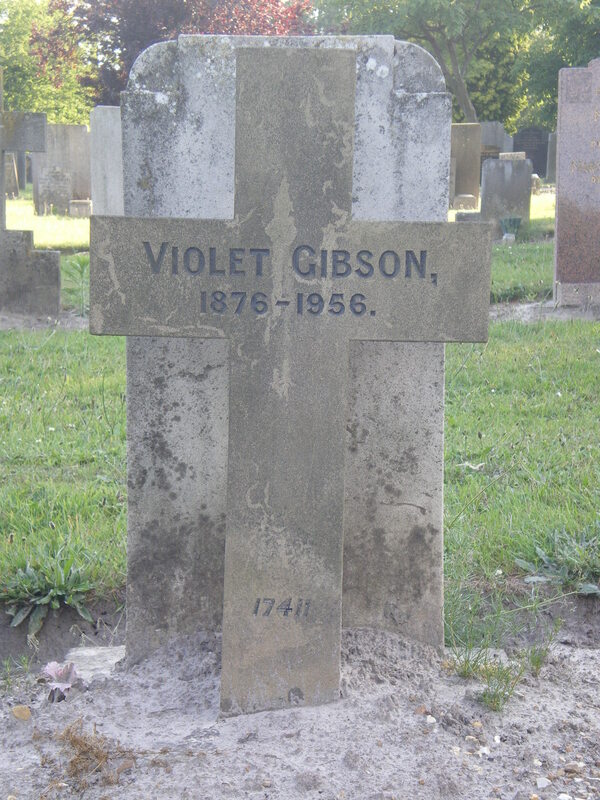 I was a history teacher and had taught Fascist Italy at school; I knew all about the 1926 incident; I’d never realised Violet Gibson had a local grave. In 2010, Frances Stonor Saunders published “The Woman Who Shot Mussolini” about Violet Gibson if you would like to read more. The Amazon page for the book is here.